Shrimp is a lower animal without specific immune system. Thus, its ability to resist pathogens is poor. There is currently no vaccine for disease prevention in shrimp. Weak shrimp is easily susceptible to virus (e.g., white spot, Taura syndrome) and bacteria (e.g., Vibrio). If shrimp has serious disease, farmers have to not only deal with reduced yield, even face lost, but also pay for the expensive cost of pond treatment. Shrimp body temperature varies based on temperature of the surrounding water. When weather changes, shrimp is easily shocked, becomes weak and susceptible. When there is prolonged hot, sunny weather (water temperature above 32 degrees Celsius), white feces syndrome often appears. 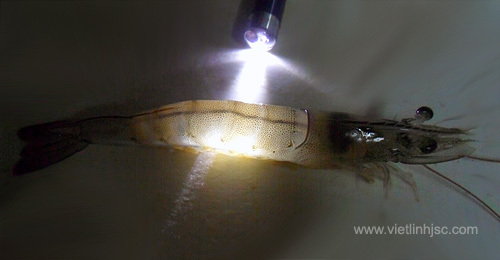 During cold weather (water temperature below 25 degrees Celsius), shrimp catches prey weakly, even stops eating; white spot syndrome can occur. It is an urgent for preventing diseases in shrimp, especially when there are weather changes. Some signals of shrimp infected by diseases are its lethargic swimming on the water surface or near pond banks, shores, feeding trays. Shrimp reduces eating, may die at the pond bottom. Meanwhile, healthy shrimp will live with infected and dead shrimp. Healthy shrimp can eat dead shrimp, making the disease become more widespread. When shrimp is infected by diseases, it often stops eating. Medicined mixed into feed will not get into shrimp body; thus, treatment is ineffective. Therefore, the earlier diseases in shrimp can be detected, the higher chance it will be cured. When shrimp is infected, farmers often urgently harvest while still using medicines and chemicals for shrimp. This affects the quality of shrimp. Thus, disease prevention is important and necessary to do. Avoid waiting for shrimp to be infected to cure later. Increase aeration to provide dissolved oxygen, create a favorable environment for microbial decomposition, and release of toxic gases. Increase the use of bioproducts to decompose waste, treat poisonous gas, and stabilize alkaline, pH, algae. Siphon water in pond if possible. Do not exchange water in pond with external sources if treatment is not processed thoroughly. This can help avoid spreading diseases to surrounding environment. Check the amount of feed; temporarily reduce feed to limit environmental pollutants in pond, minimize the accumulation of toxic gases, and control the density and growth of bacteria. Strengthen shrimp’s resistance and recovery by adding vitamins, especially vitamin C and minerals. If use medicine to treat shrimp diseases, it is necessary to use correct medicines with right dosages, and at right time.